Žižek's Christianity, then, provides the experience necessary for a materialist social political reality. Clearly, Žižek's view is very different to the historic Christian doctrine of the atonement. And it is here that I have some difficulty in accepting that Žižek has actually passed through the Christian waters at all. Surely, to have anything like a Christian experience, one would need to, at least, believe what Christians actually believe. First, Žižek insists that the crucifixion is open to interpretation, as if Paul was free to make of it what he wanted (and Žižek is free to make of Paul whatever Žižek wants to). However, for the Christian, all events in history are pre-interpreted by Christ and the truth is attested by Christ in whom is “hidden all the treasures of wisdom and knowledge” (Col 2:3). In other words, Christ already knew the meaning of his death on the cross before he was incarnate. For the event in question, the interpretation is found fully in Christ himself, then, in regards to what we are to know about it, the interpretation is found in the prophets of the Old Testament and in the Apostles of the New. The Christian trusts in an all-knowing God and then proceeds to think his thoughts after Him. Second, in regard to human sin, Žižek is mistaken. Sin is hostility towards God, a turn from following his interpretation of the world. It is God's interpretation of human life that counts. He gave human beings a task to fill the earth and subdue it; he distinguished between male and female human beings; he interpreted the very food that they should eat and the food they should not eat; and on that day God's interpretation of his own work was that it was very good (Gen 1). The sin of human beings is the turn to our own interpretation of events – “being like God” was the tantalizing prospect offered by the serpent. Did the first human beings become God? No, the serpent is a liar, and lying is no “aspect” of truth. Human beings became cursed, under the wrath of God, and were banished from the garden. I am not sure any of that leads to materialism, unless, of course, one is already a materialist. But then there is no need to invent a materialist version of Christianity. 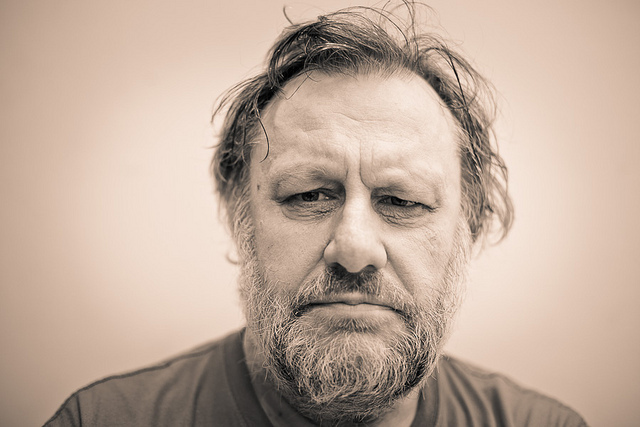 Žižek's version of Christianity is ultimately parasitic on the real one; it is a kind of parody of truth. But parody requires reality to make its point like impressionists require a real person to impersonate. 1Slavoj Žižek, The Puppet and the Dwarf: The Perverse Core of Christianity (Cambridge, Mass: The MIT Press, 2003), 6. 8Frederiek Depoortere, Christ in Postmodern Philosophy: Gianni Vattimo, Rene Girard and Slovoj Žižek (New York: T&T Clark, 2008), 128. 10John Calvin, Institutes of the Christian Religion, ed. John McNeill (Louisville: Westminster John Knox Press, 2006), III. 2. 7. This is great - provides a great summary/introduction to Žižek's "thought." The more that I read about him and the little that I have read of him (this is the article i was referring to a few months back - http://jacobinmag.com/summer-2011/the-jacobin-spirit/ ) the more I am shocked that there are so many people who take him seriously. In some ways it makes sense: in a hyper pragmatic society we can use whatever elements of any thought system we want and discard everything else, even if our own purposes are antithetical to the thought system we are using to get there. "Among liberal theologians of a certain stripe there appears to be a kind of desperate quest for novelty; those who take part in this derby seem to vie with each other to see who can make the most outrageous pronouncements... According to Altizer, the real Christian recognizes that atheism is the truth; and now Sheehan adds, in a spectacular burst of insight, that this is the gospel Jesus Christ himself brought! Colossal! There is only one way to go beyond this: to hold that God himself, eternal, omnipotent, and omniscient as he is, was an atheist even before Jesus, and suffered from a distressing inability to get the message across." On that note, thanks for the post. Keep up the good work.